39 The melancholy catastrophe which occurred on the Tay on that fatal Sunday morning caused a great sensation in Dundee and Newport. The various congregations in town were assembling for the forenoon service when the news reached the shore. The sad tale spread rapidly throughout the town, and a general rush was made to the Craig Pier to learn particulars of the disaster. The churches in Dundee were almost deserted that forenoon. The Rev. Dr. Maule had just begun worship in the Parish Kirk of Forgan, when someone, breathless with excitement, entered the sacred edifice, and whispered the sad tidings to those in the back pews. In a few minutes the tale spread from pew to pew all over the church, and the excitement became so great that the clergyman found it impossible to proceed, and he thereupon closed the service and dismissed the congregation. Widespread sympathy was expressed all over the country for those who had been bereaved by this lamentable accident, and liberal subscriptions were raised for their relief. A public meeting was held 40 in the Exchange Coffeeroom, Dundee, on 28th June, at which Mr. David Jobson presided, for the purpose of setting on foot a public subscription for the relief of the bereaved families, and also to take steps to inquire into the causes of the accident. On the motion of Captain Blair, a committee was appointed to collect subscriptions for the relief of the sufferers. We may here mention that this fund formed the nucleus of the fund raised for the establishment of the Dundee Orphan Institution. On behalf of this fund, the Rev. Dr. Thomas Chalmers, then about to leave Kilmany, preached a sermon in the East Church on a Sabbath evening in June of the memorable year of 1815. At the meeting in the Exchange Coffeeroom, it was further resolved to take action in conjunction with the freeholders of the two counties of Fife and Forfar, with the view of inquiring into the state of the Ferries, to ascertain if some improvement could not be adopted in their management. The result of this movement was that a Joint Committee of inquiry, (Mr. Berry of Tayfield, Convener), was appointed, and a searching investigation was made into the whole subject. It was found that there was a large traffic carried on, from which a sufficient revenue was derived to maintain a more efficient system, and also to provide better harbours and landings on both sides. The traffic for the year 1816-17 was reported to have been as follows: - Passengers, 91,663 ; cartloads of goods, 13,612 ; horses, 2659 ; cattle, 2371 ; 41 sheep, 4357; swine, 126; coaches and gigs, 670. The revenue derived from this traffic amounted to £3177 11s. 10d. There was no want of boats to convey the traffic across the river, there being, as we have already stated, about twenty-six or twenty-eight boats of all descriptions engaged on the Ferries. But there was no regulation nor supervision of the boatmen, nor any restriction placed on the number; all that was required being a licence from Lord Douglas, who claimed to be the Superior, and such licences were only too easily obtained. The report of the Committee was submitted to a meeting of the Justices of the Peace of the Counties of Fife and Forfar, which was held at Newport on 13th September, 1817. Provost Redoch, Dundee, presided at that meeting. The report was adopted, and it was further resolved to apply to Parliament for an Act to place the Tay Ferries under the management of the Justices of the Peace of both counties as Trustees. Accordingly, an Act was prepared and laid before Parliament, and, after passing through the various stages, it received the Royal assent in June, 1819, being the fifty-ninth year of the reign of His Majesty George III. The Act was entitled 'An Act for erecting, improving, regulating, and maintaining ferries and passages across the River Tay in the counties of Fife and Forfar'. The Trustees under the Act consisted of the Justices of the Peace and Commissioners of Supply in both counties, the persons appointed by the 42 subscribers to act on the Committee of Management, the Lord Chief Baron of the Court of Exchequer in Scotland, the Lord President of the Court of Session, the Lord Justice Clerk, the Lord Chief Commissioner of the Jury Court, the Lord Advocate, the Commander of His Majesty's Forces in North Britain, the Sheriff Deputes of the counties of Fife and Forfar, the Provost of Dundee - all for the time being. The first general meeting of the Trustees was held in the Town Hall, Dundee, on Wednesday, 28th July, being the fourth Wednesday after the passing of the Act. By the provisions of the Act, a Committee of Management, consisting of sixteen of the Trustees named, had to be immediately appointed. The Provost of Dundee, by virtue of his office, was a member of the Committee. Five were to be elected by the subscribers, and five by each of the counties. This was the constitution of the Tay Ferries Trust. By the powers conferred in the Act, the Trustees were entitled to claim all rights of property and jurisdiction on the Ferries on the Fife side from Ferry-Port-on-Craig to Balmerino, and from Broughty Ferry Castle to Invergowrie on the Forfar side of the river. Provision was also made for the transference of all rights claimed by Lord Douglas, then belonging to Mr. Stewart of St Fort and Mr. Berry of Tayfield, as well as the power to purchase the Craig Harbour from the burgh of Dundee and ground on the Fife shore for the erection of piers. 43 Immediately after the passing of the Act, the Trustees appointed a superintendent at a salary of £80 per annum, with a free house. His first duty was to arrange a more systematic method of working the passage. All the boats plying on the Ferries were taken over by the Trustees at a valuation, and the number reduced to eight. Regular hours were fixed for sailing, and the yawls and pinnaces were more thoroughly equipped, and manned with picked crews. So vigorously did the Managing Committee set to work that the new system was put into operation by the end of the month of August of the same year. On the 7th of September following a number of the old boats and pinnaces formerly employed on the Ferries were sold by public roup in the Town Hall, Dundee. The following is a list of the boats disposed of on that occasion: - Yawls - Hercules, 15 tons; Pitlessie, Pitfour, James, and Jean, 14 tons each ; Berry, 13 tons. Pinnaces - William, Neptune, Tayfield, Martha, Helen, Margaret, James and Nancy. These boats measured from twenty to twenty-four feet over the stems. A small pinnace named the Jean, about fourteen feet long, was also included in the list offered for sale. Compensation was given to the ferrymen for loss of employment by the new arrangement The young men were employed by the Trustees, while the old men were pensioned off. The last of these pensioners, named David Greig, died in 1850. His forefathers had been connected with the Ferries for more than two hundred years. 44 The Trustees took possession of the Ferries in August, 1819, and that year opened up a new era in the history of Newport. The regularity of sailing, and improved condition of the boats, inspired the public with confidence, and the traffic increased rapidly. While the Act was before Parliament the attention of the promoters was directed to the advantage of employing steamboats on the passage, and the rapid increase of all kinds of traffic induced the Trustees to make the experiment. Accordingly, a twin boat was built, and fitted with a steam-engine, by the Messrs. Carmichael, of Ward Foundry, and put on the Ferry in the year 1821. The construction was somewhat peculiar. Two distinct hulls, built of iron, with two keels, fastened together by the deck beams and transverse stays, formed the hulk of the vessel. A deck with bulwarks covered the double hull, and the paddle-wheel was placed in the centre, to preserve it from being damaged by ice. The length of the deck was ninety feet and the breadth twenty-nine and a half feet. At first only one boat was built for the Ferry, but another was added in 1823, when the Messrs. Carmichael introduced the reversible motion in steam-engines, so that the boat could be propelled ahead or astern as circumstances required. The boats were manned by a coxswain or captain, an engineer, five seamen, and a fireman. The passage across the Ferry by the new boat was rendered so easy and pleasant, as compared with the old boats, that someone 45 said it was more like crossing a bridge than sailing. For a year the boat plied alternately from Dundee to Woodhaven and Newport, but, as it was found to be a great inconvenience to keep up the two ferries, it was resolved to abandon Woodhaven, and make Newport the landing place on the Fife side. According to the terms of the Act, the Trustees were bound to maintain two ferries, so they again applied to Parliament and obtained a new Act, constituting Newport the only Ferry station. The old pier at Woodhaven was therefore abandoned, but its owner, Mr. Stewart of St Fort, received a sum of money as compensation for the loss of the revenue derived from the Ferry. Separate surveys of the river and plans for the piers were, by order of the Trustees, prepared by Mr. Stevenson and Sir Thomas Telford, civil engineers, and, after a long discussion by the Trustees, the plans submitted by the latter gentleman were adopted, and the erection of the piers was entrusted to him. The site of the new piers at Newport was then an open beach, the tides flowing over the ground now occupied by the road-way and buildings, to the base of the rocky precipice, the summit of which is occupied by a few old cottages. The new works were begun in 1823, but, previous to that, a temporary wooden jetty was erected at the old harbour of Newport for the accommodation of the steamers. The foundation stone of the new piers was laid on l0th September, 1823, on which occasion a grand Masonic 46 demonstration took place in honour of the event. The Provost, Magistrates, and Town Council, and other public bodies in the town, and the various Mason Lodges, formed in procession, and marched to the Craig harbour and embarked on board the steamers for Newport. The ceremony was performed by Lord Panmure, as Provincial Grand Master of the Masonic bodies in the East of Scotland. These piers, which are now the only Tay Ferry Harbours, were found to be a great benefit to the navigation. Under the new management and with the advantages of good landing piers and steamboats, the traffic and revenue increased rapidly. In an article on the Tay Ferries by Captain Basil Hall, R.N., which appeared in the 'Edinburgh Philosophical Journal', the traffic returns for the first four years, under the management of the Trustees, are given, showing how rapidly the traffic increased under the new regime. During the year 1820, the first year of the Trustees reign, and a year before the introduction of steamers, the number of passengers that crossed the Ferries amounted to about 70,000. 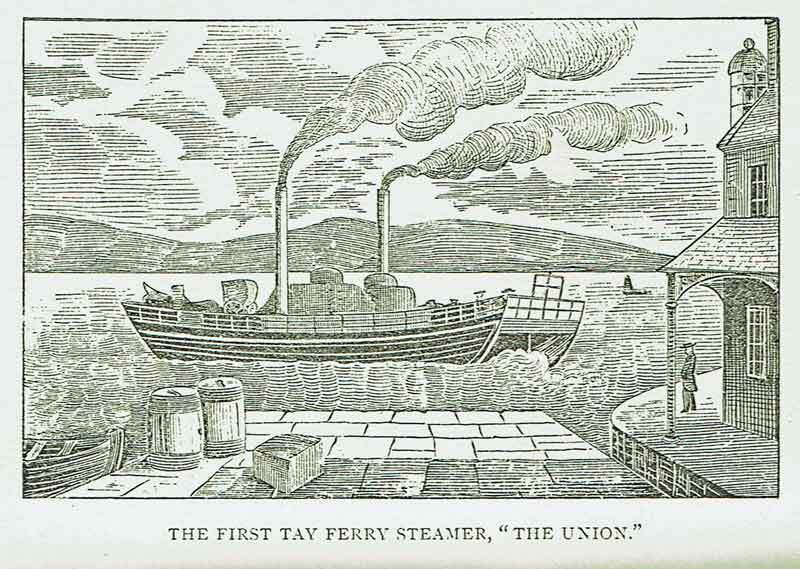 In the year 1824, three years after the steamers had begun to ply, the total number of passengers was 100,536. In that same year 130 carriages, 474 gigs, 6627 heads of cattle, 15,449 sheep, 477 horses, and 2562 loaded carts were ferried across the river. In the year 1820 the revenue amounted to £2510; in 1821, to £2526 ; in 1822 to £3209 ; in 1823, to £3532 ; and in 1824 it had amounted to £3790. 47 The twin boats continued to ply daily with great regularity, sailing every half-hour from the one side to the other. The distance in a straight line between the two piers is about 2760 yards, but owing to the sandbanks the steamers had to deviate more or less from the straight course in crossing, according to the state of the tides. With the deviations the maximum distance which the boats had to traverse was about two miles and a third, and the length of time they occupied on the passage in ordinary weather was 17 minutes at neap, and 20 minutes at spring tides. In addition to the steamers a large sailing boat and a pinnace, manned with good crews, were employed by the Trustees, and kept in readiness to accommodate the public when the pressure of traffic was too great for the steamboats to overtake. 50 Her consort, 'George IV. ', was put on the passage in 1823. Both vessels were constructed on the twin principle, which has already been described. The 'George IV.' was built by the Messrs. Carmichael, of the Ward Foundry, Dundee. Mr. James Carmichael, of that firm, the inventor of the 'fan blast', while thinking over the plans for the engines, had his attention directed to the advantage which would be gained by applying a reversible motion to the engine. The suggestion emanated from his brother, Charles, who is said to have remarked, 'Man, cud we no mak' a boat to go backward as well as forward?' to which James replied, 'Well, that is worth thinking over.' After much thought and labour, these eminent engineers succeeded in constructing the engines with a backward and forward motion, and the principle, then introduced for the first time, has been found one of the greatest improvements on the steam engine. The 'Union' was superseded by the 'Tayfield' in 1836. The 'George IV.' was rather an unfortunate craft On the night of Saturday, February 7th, 1824, the vessel was discovered to be on fire, while lying at her moorings in the Harbour, and to save the ship from total destruction it was scuttled and sunk. The damages were afterwards repaired, and the boat continued to ply on the passage till the 'Princess Royal' was built in 1840, named in honour of Her Majesty's eldest daughter, who was born in that year. This vessel was also constructed on the twin principle, and 51 was built by Mr. Borrie, at Broughty Ferry and launched on Friday, 11th December, 1840. Her length on deck was 106 feet, and her breadth 34 feet, giving an area of 3604 square feet ; she had two hulls, and was propelled by two engines of 80 horse power each. With the aid of this boat the traffic was carried on more effectively than it had ever been before, and an expeditious passage was rendered practicable in all states of the weather. The 'George IV.' was afterwards sold by public auction. The 'Tayfield' and 'Princess Royal' continued to ply on the Ferries for the next twenty years. In 1858 the 'Fifeshire', which was built in Glasgow, arrived in Dundee on the 14th December, and was then put on the passage. She was followed in 1861 by the 'Forfarshire', built by Messrs. Gourlay Brothers, Dundee, the two vessels being of a more modem construction, and far more powerful and commodious boats, than any of their predecessors. From 1821, when the first steamer was introduced, the traffic increased year by year, as has already been shown by the statistics of the traffic of the first four years. In the year 1834, the traffic returns were as follows: - Passengers, 866,071 ; four-wheeled carriages, 269 ; gigs, 578 ; horses, 1379 ; carts, 3127 ; cattle, 4588 ; sheep, 11,911 ; cartloads of goods, 2788 ; barrels, bulk of goods, 8375. The revenue for the year amounted to £4844 5s. 5d. It will thus be seen that the traffic and revenue had increased to about double what it was twelve 52 years previously. Notwithstanding the increased revenue it was found that the Ferries did not pay the working expenses and the interest on borrowed money. Fares at first were fixed at 6d. and 9d. for passengers. In July, 1828, the Trustees, with the view of increasing the revenue, raised the fares from 6d. and 9d. to 9d. and 1s. As might have been expected, the advance of fares failed to produce the desired effect, for in 1835 we find that the Trustees resorted to another expedient with the object of making both ends meet. The management of such a growing business had become irksome, and to relieve themselves of the onerous burden the Trustees let the Ferries to a tacksman at a yearly rent of £2200 on a lease of five years. Out of this rent the Trustees had to pay interest at 3 per cent, on the debt, which amounted to £40,000. The lessees were bound to maintain the Ferries in good working order, and under their management the traffic was largely increased. In 1838 the tacksman, desirous of affording the inhabitants of Dundee an opportunity of visiting Newport in the summer months, issued return tickets from Dundee to Newport at 6d. after four o'clock every afternoon on weekdays. This boon was largely taken advantage of, and in the following year (1839) the same arrangement was carried out, the hour for issuing return tickets being fixed at three o'clock. This arrangement was also extended to the Fife side of the river, which had not been done in the previous year. The fares continued to be 53 maintained at the usual high rates during the rest of the year, but in May, 1853, they were reduced to 2d. on week-days and 1d. on Saturday, The Ferries ultimately fell into the hands of the Government, who handed them over to the Scottish Central Railway Company, who managed them for a number of years. During the Company's reign the fares were permanently reduced to 6d. The Committee also waited on Mr. Cookston, the superintendent, but he informed them that he had no power to interfere with present arrangements. The matter excited considerable interest in the community, and leading articles appeared on the subject in the local newspapers. The memorial, however, had the desired effect. The Directors rescinded their obnoxious regulations, and from that time the boats only made the number of passages on Sabbath required by Act of Parliament, the hours being arranged so as not to interfere with the privileges of the men. These concessions came too late to prevent the retirement of the captain and the mate. Their resignations were confirmed, and they left the service, to the sincere regret of their numerous friends. A public subscription was set on foot to present them with 57 testimonials as a mark of the esteem in which they had been held. On Saturday, 28th October, the subscribers met in the British Hotel, Dundee, when the testimonials were presented by Mr. John Berry, of Tayfield. A timepiece, with a suitable inscription, and a purse of ten sovereigns, were presented to Captain Duncan ; and a purse of ten sovereigns was also presented to Mr. David Dorward. In November, 1873, the Dundee Harbour Trustees bought the Ferries from the Caledonian Railway Co. for the sum of £20,000. Under the management of the Harbour Board the passage money has now been permanently reduced to 3d. on weekdays, and 2d. on Saturday, while composition tickets for any period are issued at reasonable rates.